Eric writes: I recently found myself with a French cuff shirt and no cuff links. I don’t wear suits all that often, but I’d still like to find a respectable set of links that I can wear to weddings and other classy events. Where should I be looking, what should I be looking for, and what can I expect to pay for a respectable but not too gaudy set of cuff links? There are only a couple of kinds of jewelry a man can reasonably wear. Of those few, cuff links are almost certainly the most fun. First: if there is one style-related item you do not buy new, make it cuff links. Vintage and antique cuff links are plentiful and dramatically less expensive than their contemporary equivalents. Whether you’re buying fine jewelry or a costume piece, you will pay dramatically more in a department store than you would for something similar on ebay, at an estate sale, or even in an estate jewelry shop. As far as what to look for, there are a wide variety of options. 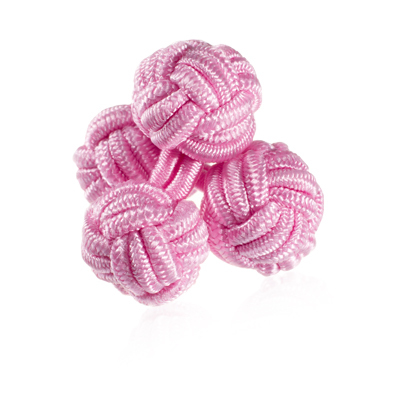 The most basic are silk knots. They come in a variety of colors, are inexpensive, and appropriate for most occasions. You’re missing a chance to wear beautiful jewelry, but you’re also getting something quite attractive and sophisticated for ten bucks or so. Beyond that, you can let your imagination run wild. There are huge volumes of base metal (ie non-precious metal) links from the mid-20th century available at flea markets, thrift stores and on ebay for five, ten or twenty dollars a pair. If you want something fun, that’s an easy way to go, though even precious metal links can be pretty inexpensive, so I don’t see much reason to go ultra-cheap. If you’re comfortable spending a little more money, get something in a precious metal. Silver or gold, either solid or with some adornment like enamel or mother-of-pearl (or both, as above) is a great choice for almost any occasion. You can even kick it up a notch to small precious stones, though at that point you’re looking at serious money. Precious metals will be marked (something like “.925” or “14K”) – if there’s no mark, or the mark says “base metal,” it isn’t silver or gold. Silver can tarnish over time, while gold will not, but both are fine for most any occasion. If you pay a good price, your jewelry will only grow in value. I’d recommend that if you’re buying one pair of links, it shouldn’t be funny or cheeky. Cute cuff links have their place, but you should have a pair that will always work before you start buying pairs that sometimes work. I prefer double-sided links, or at least ones with a finished second side. 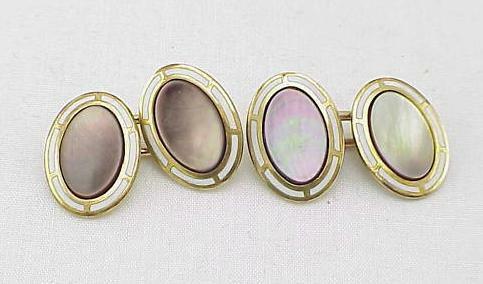 Double-sided links were very popular from the Victorian era through the thirties or so, when toggles came into vogue. Toggles are perfectly fine, but a little bit ugly to my eye. My own links including a simple mother-of-pearl pair that lives in my travel toiletries, so I don’t arrive somewhere with a french cuff shirt but no links, along with a fine pair of gold and navy blue enamel bars that were purchased for me as a gift at an estate auction, a pair of brown leather links that I wear with casual and tweedy outfits, and a pair of silver mid-century links with an star-explosion motif and a matching tie bar that were also a gift. None but the gold and enamel pair were especially expensive, and all have their place.